A brace from Megan Rapinoe led Seattle Reign FC over Sky Blue FC 4-1 on Saturday night at UW Medicine Pitch at Memorial Stadium in Seattle. Jodie Taylor and Allie Long also chipped in a goal on the night for the Reign, while Sky Blue FC rookie midfielder Savannah McCaskill got one back for the visitors. Taylor’s finish, her third of the year, came in just the fifth minute of play. Rapinoe doubled the lead for the Reign in the 38th minute and then put her stamp on it in the 60th minute, her fourth goal of the year. McCaskill got her side on the board when she scored in the 62nd minute, her second goal of the season. Long sealed the game in the 84th minute when she tapped one away to improve the Reign to 4-1-1 on the year. Sky Blue FC is still winless this season and sit at the bottom of the standings at 0-4-1. The Reign didn’t waste any time on Saturday night when Steph Catley served a ball across the box. Taylor was crashing the net and hit it one-time in for the early go-ahead goal. The Reign dominated possession in the first half with 57.3% to Sky Blue’s 42.7%. The Reign also held the advantage in shots with 15 and four on target to Sky Blue’s three shots and just one on target. The Reign started goalkeeper Lydia Williams in net for the first time all season and the Australian international finished the game with four saves. Sky Blue’s best look in the first half was sparked by forward Katie Johnson. Johnson scored a brace for Sky Blue in Week 6 and was dangerous in the final third at the 15th minute before Williams was able to come up with the save. In the 38th minute Rapinoe doubled the Reign’s lead off of a technical finish from the top of the box. Rapinoe finished the match with seven shots off and three on goal. 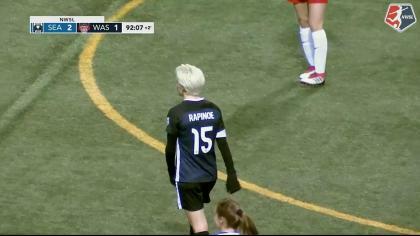 This was Rapinoe’s first game back after missing the Reign’s last three matches with a hamstring injury. The Reign rolled into the break up 2-0. The second-half continued to be controlled by Seattle. Long was steady in the midfield keeping the lines connected and making sure Sky Blue didn’t get any breaks into Johnson or McCaskill who were both looking to press the Reign’s backline. Eventually it was the Reign and Rapinoe who dictated the second-half narration. Reign midfielder Nahomi Kawasumi played Rapinoe a through ball down the left flank and Rapinoe cut the ball inside and finished it far post for a brace in the 60th minute. Just two minutes later, McCaskill, the only player on Sky Blue besides Johnson who has scored this season, responded. Carli Lloyd combined with McCaskill and the rookie chipped Williams to put her team on the board. Sky Blue had a couple more chances from McCaskill to narrow the scoreline, but it was Seattle’s Long who sealed the game in the 84th minute. Rumi Utsugi crossed one in and it hit off the far post and Long was just in front to tap it in. Long finished the match with a team-high 76 touches. Utsugi scored her first goal of the season in Week 6 which was the eventual game-winner for the Reign over Portland Thorns FC in the Cascadia rivalry thriller. To make even more special for the Reign, long-time midfielder Jess Fishlock was recognized for her 100 appearances with the club. The Reign will next host the Chicago Red Stars for a Week 8 match-up on Saturday, May 19 and Sky Blue FC will host the North Carolina Courage. Match ends, Seattle Reign 4, Sky Blue 1. Second Half ends, Seattle Reign 4, Sky Blue 1. Attempt missed. Allie Long (Seattle Reign) header from the centre of the box is too high. Assisted by Stephanie Catley with a cross following a corner. Corner, Seattle Reign. Conceded by Jennifer Hoy. Attempt missed. Thaisa (Sky Blue) left footed shot from a difficult angle on the left is close, but misses to the left. Assisted by Savannah McCaskill with a cross following a set piece situation. Substitution, Sky Blue. Jennifer Hoy replaces Mandy Freeman. Corner, Sky Blue. Conceded by Lydia Williams. Attempt saved. Katie Johnson (Sky Blue) header from the centre of the box is saved in the bottom right corner. Assisted by Savannah McCaskill with a cross. Offside, Sky Blue. Thaisa tries a through ball, but Carli Lloyd is caught offside. Goal! Seattle Reign 4, Sky Blue 1. Allie Long (Seattle Reign) with an attempt from very close range to the bottom left corner following a corner. Attempt blocked. Rebekah Stott (Sky Blue) left footed shot from outside the box is blocked. Substitution, Sky Blue. Thaisa replaces Janine Beckie. Delay in match Katie Johnson (Sky Blue) because of an injury. Attempt missed. Savannah McCaskill (Sky Blue) right footed shot from outside the box is close, but misses to the left. Attempt saved. Shea Groom (Sky Blue) right footed shot from the right side of the box is saved in the centre of the goal. Assisted by Katie Johnson. Substitution, Seattle Reign. Beverly Yanez replaces Megan Rapinoe. Goal! Seattle Reign 3, Sky Blue 1. Savannah McCaskill (Sky Blue) right footed shot from the right side of the box to the top left corner. Assisted by Carli Lloyd. Substitution, Sky Blue. Raquel Rodríguez replaces Sarah Killion. Goal! Seattle Reign 3, Sky Blue 0. Megan Rapinoe (Seattle Reign) right footed shot from the left side of the box to the bottom right corner. Assisted by Nahomi Kawasumi. Attempt missed. Savannah McCaskill (Sky Blue) right footed shot from outside the box is too high. Assisted by Carli Lloyd. Attempt missed. Rumi Utsugi (Seattle Reign) left footed shot from outside the box is too high. Offside, Seattle Reign. Kristen McNabb tries a through ball, but Jodie Taylor is caught offside. Attempt missed. Carli Lloyd (Sky Blue) right footed shot from long range on the right is high and wide to the right. Assisted by Shea Groom. Offside, Seattle Reign. Stephanie Catley tries a through ball, but Megan Rapinoe is caught offside. Attempt saved. Savannah McCaskill (Sky Blue) left footed shot from the left side of the box is saved in the centre of the goal. Attempt blocked. Carli Lloyd (Sky Blue) left footed shot from the centre of the box is blocked. Attempt blocked. Shea Groom (Sky Blue) header from the centre of the box is blocked. Assisted by Sarah Killion with a cross. Second Half begins Seattle Reign 2, Sky Blue 0. First Half ends, Seattle Reign 2, Sky Blue 0. Attempt blocked. Jodie Taylor (Seattle Reign) right footed shot from very close range is blocked. Attempt missed. 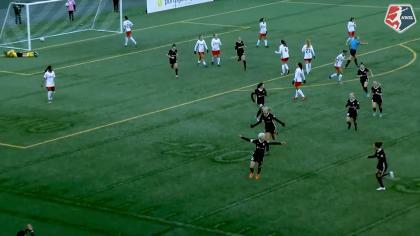 Jessica Fishlock (Seattle Reign) left footed shot from outside the box is close, but misses to the left. Assisted by Megan Rapinoe with a headed pass. Offside, Seattle Reign. Rumi Utsugi tries a through ball, but Megan Rapinoe is caught offside. Attempt missed. Megan Rapinoe (Seattle Reign) right footed shot from outside the box misses to the left. Assisted by Kristen McNabb. Goal! Seattle Reign 2, Sky Blue 0. Megan Rapinoe (Seattle Reign) right footed shot from outside the box to the top right corner. Attempt missed. Carli Lloyd (Sky Blue) right footed shot from outside the box is high and wide to the left from a direct free kick. Attempt missed. Carli Lloyd (Sky Blue) right footed shot from outside the box is too high. Assisted by Janine Beckie. Attempt missed. Allie Long (Seattle Reign) left footed shot from outside the box misses to the right. Attempt missed. Megan Rapinoe (Seattle Reign) left footed shot from the right side of the box is too high. Assisted by Stephanie Catley. Attempt blocked. Megan Rapinoe (Seattle Reign) right footed shot from outside the box is blocked. Assisted by Jessica Fishlock. Attempt blocked. Jodie Taylor (Seattle Reign) left footed shot from the left side of the box is blocked. Attempt missed. Jessica Fishlock (Seattle Reign) right footed shot from outside the box is close, but misses the top right corner. Attempt saved. Katie Johnson (Sky Blue) right footed shot from the right side of the box is saved in the centre of the goal. Assisted by Carli Lloyd. Christina Gibbons (Sky Blue) wins a free kick in the attacking half. Corner, Sky Blue. Conceded by Stephanie Catley. Attempt saved. Megan Rapinoe (Seattle Reign) right footed shot from the centre of the box is saved in the bottom left corner. Assisted by Jodie Taylor. Goal! Seattle Reign 1, Sky Blue 0. Jodie Taylor (Seattle Reign) header from very close range to the bottom left corner. Assisted by Stephanie Catley with a cross. Attempt saved. Jodie Taylor (Seattle Reign) right footed shot from the right side of the box is saved in the top centre of the goal. Assisted by Jessica Fishlock. Attempt missed. Rumi Utsugi (Seattle Reign) left footed shot from outside the box misses to the left. Attempt blocked. Megan Rapinoe (Seattle Reign) right footed shot from outside the box is blocked. Assisted by Megan Oyster.